Almost as suddenly as the electric rent-a-scooters appeared, everyone had an opinion about them. 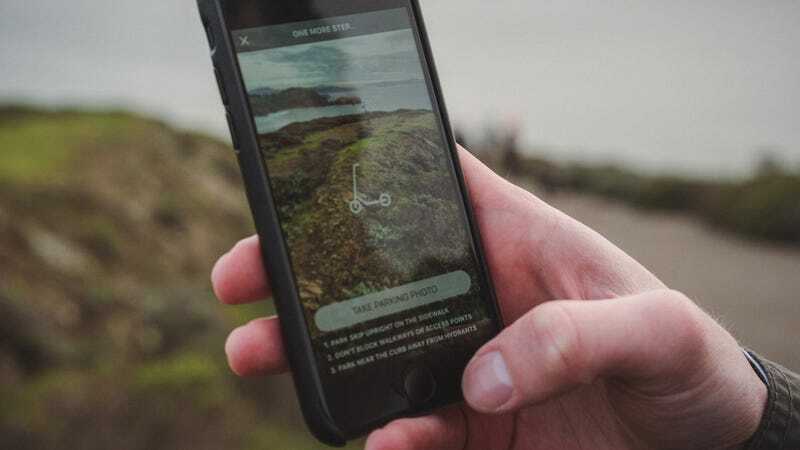 They began clogging sidewalks across the Bay Area, California in late 2017 as brands with four-letter names like Bird and Lime fought for dominance in the latest vampiric startup scheme. Folks were excited to share their takes, even if you never asked. Mostly, people said they were bad. That they are dangerous, block pedestrian pathways, pollute our beautiful rivers and streams, and are run by VC-backed tech companies that will leech away the health of our public transit infrastructure to make a quick buck. The few upsides – they could maybe potentially reduce car traffic, they’re cheap (temporarily, until one company controls the market), they’re useful in areas without reliable public transit options – seem weak in comparison. I just wondered how far they could go. 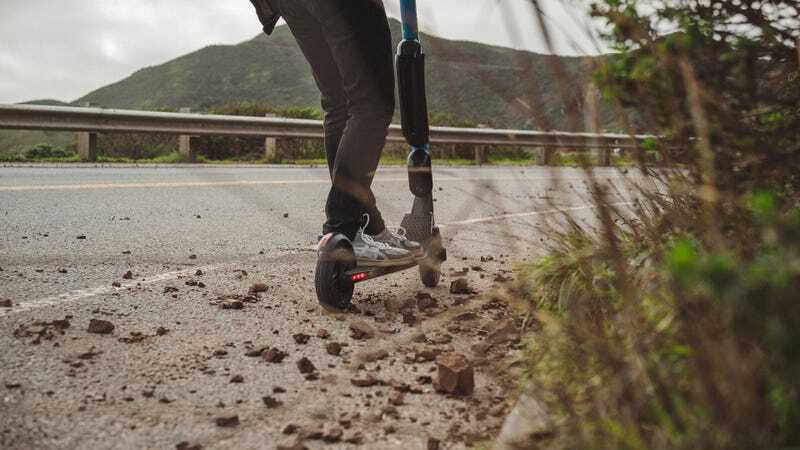 Could a scooter be used to escape? Would it be possible to ride one out into nature, beyond the reaches of human civilisation and its petty entanglements, at 25 cents per minute? I decided to find out. The plan was simple. I’d find and unlock a scooter near the Presidio, a national park in San Francisco. 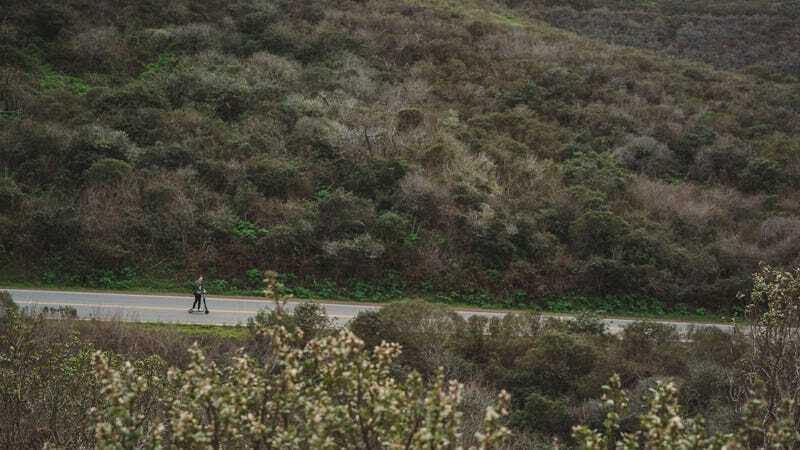 After that, I’d ride it across the Golden Gate Bridge, travel northwest through the rambling hills of the Marin Headlands, and zoom straight out to the sea. I would keep going north along the coast until the scooter died. Then I’d finally be free. It was a very stupid idea. Still, I thought it might answer a few questions about various scooter rental edge cases. Things like: do they shut off when you ride them “out of bounds”? What happens to your rental in the app when the scooter’s batteries die? Are you punished for doing so, dragged off to a e-prison? To ride one of these scooters, you typically have to go on a little scavenger hunt first. Since people can park them anywhere, they are dispersed more or less at random around the city. In the apps, there’s a map screen that shows all the scooters that are available. I found one offered by Skip (one of the two companies legally allowed to operate in San Francisco) with 79 per cent battery. Most scooter batteries last for about 15 miles, though Skip’s website claims its devices have a range of 30 miles. Even with roughly three-quarters battery life, I figured I’d be able to get far enough. Before embarking on my journey, I looked up Skip’s rules on their website to see if there was anything officially prohibiting riding one of their scooters into oblivion. 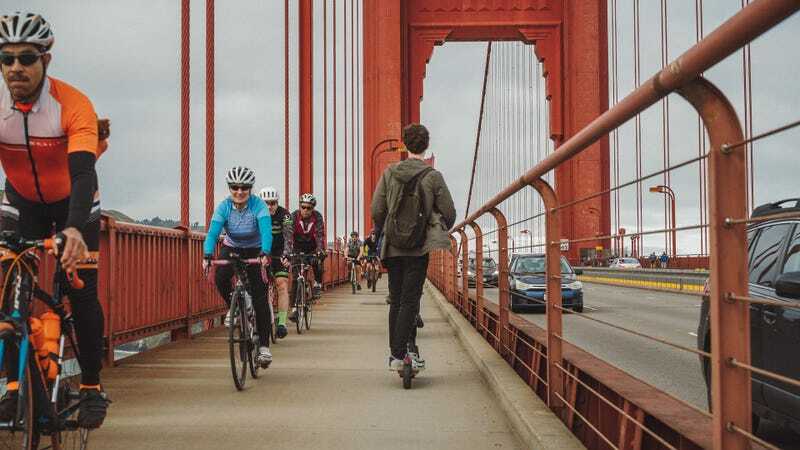 On their website, they say that in order to be an “awesome ambassador,” you must wear a helmet (you can even contact them to get one for free), avoid sidewalks, and avoid city parks. I felt I was in the clear. Additionally, Skip’s terms of service list a bunch of prohibited activities, like taking pictures of other users without their permission and being racist (seriously, read ‘em), but don’t mention anything about riding a scooter until its batteries die as a means of escaping society. Best of all, Skip’s rate schedule indicates that they “may charge you a drop off charge equal to $25.00 for for [sic] each drop or ended ride outside of the service territory area.” This seemed like a totally reasonable fee to maybe pay. That settled, I located my scooter on the street (found in the same position as all others, carelessly knocked over on a sidewalk), unlocked it, and sped off into the wild. To state the obvious: While riding an e-scooter, you look like a huge dork. Catching my reflection in a store window, I wanted to beat myself up. Despite this, the trip through the Presidio was beautiful and invigorating. On flat ground, the machine performed well, speeding along at a swift 16 mph. It struggled on hills, though, dipping to around 8 mph. But even climbing the most impressive of slopes, it never surrendered. I soon rounded a corner and the mighty Golden Gate Bridge loomed before me. The sea, unfolding westward, shimmered. The Presidio is out of Skip’s service territory area, which is limited to San Francisco proper, excluding its parks. In their app, there’s a border drawn around the map of the city. Outside the area is a purple-coloured no-man’s land, free of scooters, presumably ravaged by violent gangs with poor mobility. When I crossed into this lawless territory, I worried that my scooter would shut off and the whole plan would sputter to a stop, leaving me at the mercy of the hordes and their perverse whims. But upon entering the forbidden zone, the scooter kept moving. I was safe... for now. I rounded the circuitous path up to the Golden Gate Bridge and began crossing. It was crowded with tourists and bikers in spandex. Other than a few odd looks from people, it was mostly uneventful. The bike path along the western side of the bridge was wide and accommodating. Beyond the bridge, the small screen on the scooter indicated that I had about 50 percent battery left. Not heartening, but it would have to suffice. 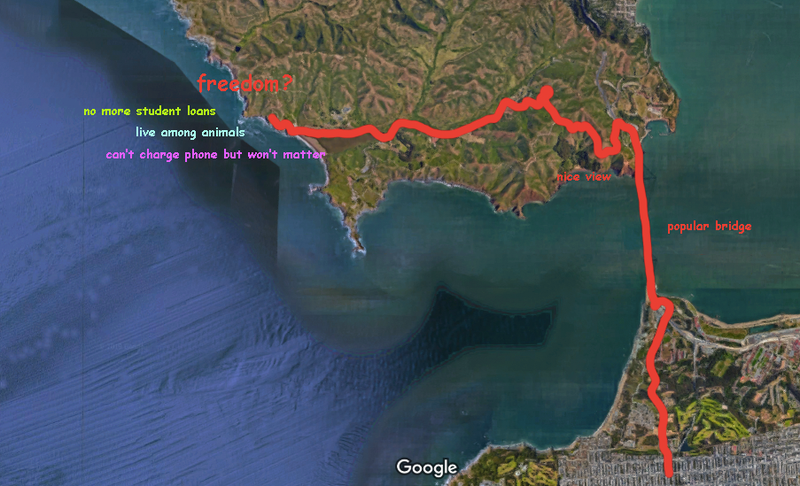 I rode west, up into the Headlands. The engine churned up the hill at 5 mph. Though sluggish, it was enough to overcome a group of road bikers, who looked upon me with searing disdain. Across the bay was a staggering view of San Francisco. I would have appreciated it, but I was too busy trying not to get crushed by passing cars, the drivers of which were enjoying this staggering view while protected by the steel armour of their vehicles. That, plus the road was in bad shape. 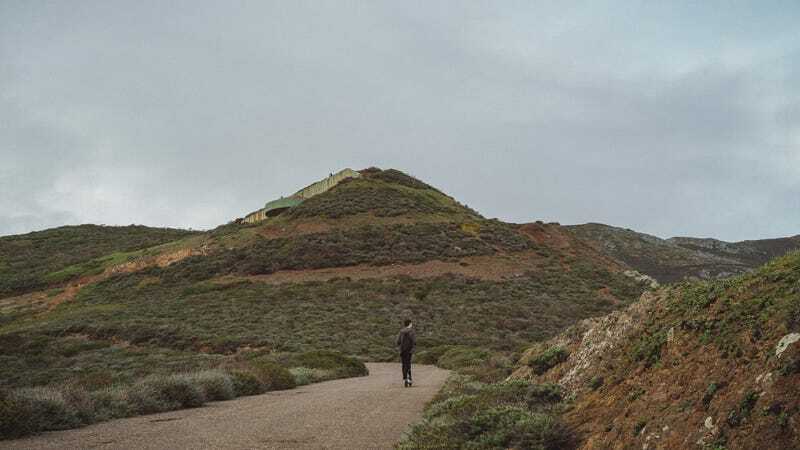 Rocks and debris had washed into it in the massive rain storms of previous weeks, and they remained uncleared thanks to the government shutdown, which was still going on at the time. Though it was a treacherous pass, I continued undaunted, inspired by the hope of a better, simpler life ahead. Around this point, my thumb started to hurt. To move forward on the scooter, you have to push the throttle down with your right thumb. It starts to hurt after a while. Maybe one day we will merge with the technology in a scooter singularity, but until then, the scooters aren’t made for long trips. Also, it should be noted that they are pretty janky. Despite their intended use in urban areas, their shoddy construction and tiny wheels seem ill-equipped to handle ageing, bombed-out city streets. They could be felled by the smallest of potholes. Should we be letting anyone ride around on these things, unsupervised? I say this as someone who spent much of his adult life bike-commuting around New York: The scooters seem incredibly dangerous. As I made my way through the hills, traffic thinned out, as did my general sense of unease. The ride became pleasant again. Out to the west, the sea beckoned. I whirred downhill along a winding road. I had about 25 per cent battery left. At the bottom of the hill, I stopped to have a sip of water. As I screwed the top back on my bottle, I noticed a coyote watching me. We quietly watched each other for a few minutes. It was possibly the first e-scooter he had ever seen. What did he think about “ride-sharing 2.0”? The last stretch of road was straight and flat, and I made it to the ocean without difficulty. 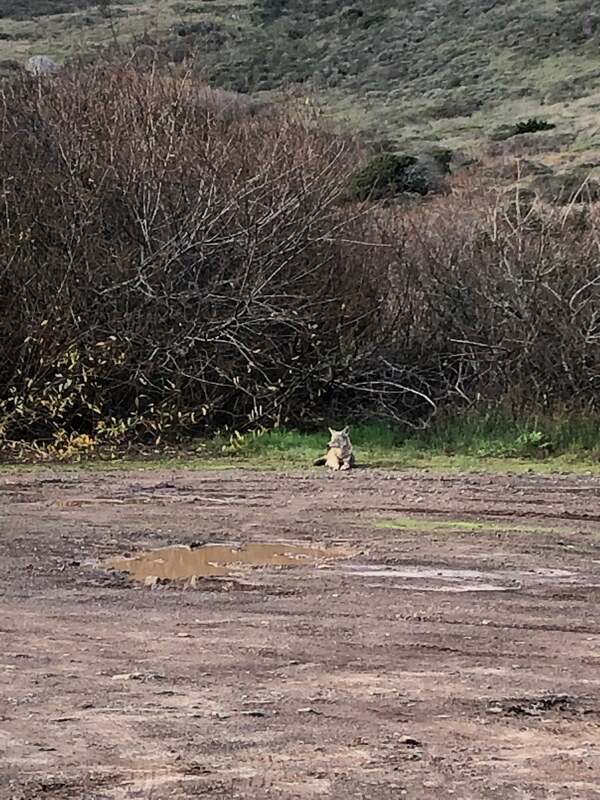 I stopped and rested in the Rodeo Beach parking lot. My friend Brandon – who tailed me on this journey – took some photos. A group of kids came up to us and asked if we were YouTubers. We told them no, but they didn’t believe us, and followed us around. What were these peoples and their strange customs? Miraculously, the scooter’s battery wasn’t yet dead, so I continued north up a hiking path. I passed a group of hikers and their dogs. They yelled at the dogs to “sic ‘em,” but their beasts were too unruly to give chase. As the hiking path turned up an enormous cliff, things unravelled quickly. The scooter’s wheels began to spin out on the gravel and mud. Its screen blinked off, but the engine kept going, petering along for a few more minutes before whirring to a halt. Even in its death throes, it bravely soldiered on. I rolled the scooter off the hiking path, onto a flat vista overlooking the Pacific Ocean. I nudged out the kickstand with my sneaker and parked it. The app asked me to take a photo of my park job, to confirm that I wasn’t blocking any sidewalks or pedestrian paths. Indeed, here among the coyotes and trees, I was not. In total, the 134 minute ride only cost me $34.50. It might suddenly cost more, if Skip ends up giving me that alleged service territory fee, but as of writing this I have not been penalised. It’s a low cost, considering that I’m pretty sure I have accomplished the deepest ride into the wilderness on a startup e-scooter in human history. I expect to hold this record for some time, given the hard limits on their battery life, and the likely crackdown on such activities as soon as this piece is published. It will be a tough record to beat, but not impossible. One could arrange to be followed by a support crew, presumably in a car, carrying charging and maintenance equipment. 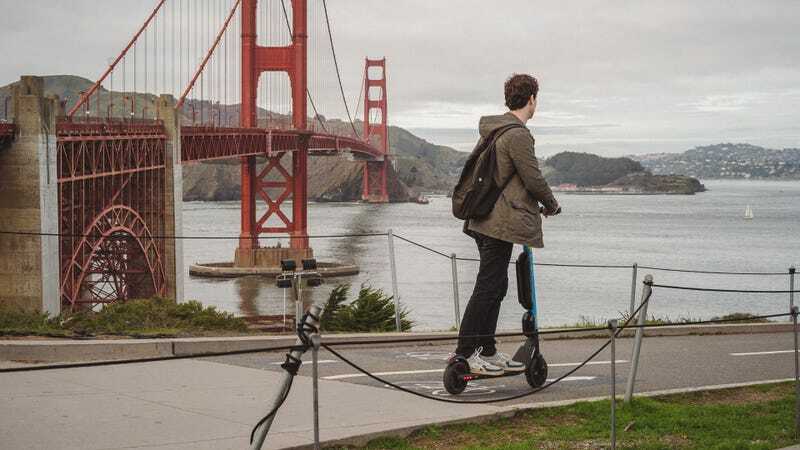 It could potentially allow one to cross the entire United States – or live an entire life – on a scooter. 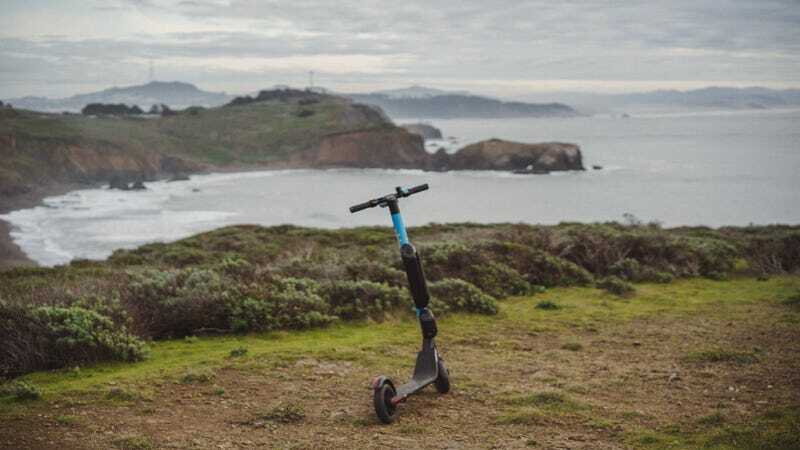 If they signed up to be a scooter charger, it’s theoretically possible to reach a kind of scooter rental equilibrium, in which the costs of operation are negated by the payments from recharging. A clean, perfect cycle. After taking in the view for a while, I decided that this life was not for me. It was rude to bring a scooter to a world in which it did not belong, where it would sully the natural environment. Unfortunately, the scooter no longer showed up in the app, and its wheels were locked. It was stuck. So I carried it a mile or so back down the mountain. Though its battery was supposedly dead, it angrily beeped at me the entire way. Back at the parking lot at Rodeo Beach, I parked the scooter near a public bathroom structure. Then, I waited at a nearby bus stop. The bus showed up as scheduled and I returned to civilization. Isn’t public transit great? Joe Veix is a writer and artist living in Oakland, CA.